Really Slick Screensavers is primarily a collection of eye candy, dazzling screensavers. You can install any of these screensavers in this collection and you can configure them however you wish. You can also view any of them without having to install them. 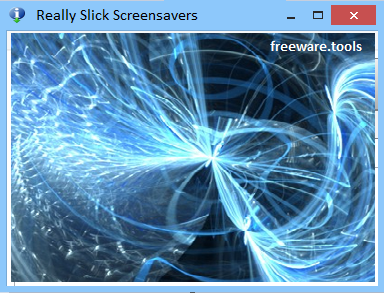 Basically, this is a collection of screensavers, and not just a single executable file. You can be selective and choose any screensaver you wish in the package. It's suited to those who have a liking to one particular screensaver and only want to install that screensaver, without the need to install an entire package in one hit. Hyperspace - "This is a real number cruncher of a screensaver. Computers are getting much more powerful these days, and my old savers don´t bring them to their knees like they use to. This one does. Of course, you can still turn the settings way down if you have a pathetic, old computer." Helios - "Throw together some attraction/repulsion particle effects and some smooth implicit surfaces and this is what you get." Euphoria - "This is about as psychedelic as screensavers get. I thought my Plasma saver was at the top of the scale, but this one is even more nauseating. You´d better find one of those airsickness bags before you stare at this one for too long." Skyrocket - "The most full-blown fireworks screensaver ever. It has bright lights, smoke trails, clouds that are illuminated by the explosions, sound effects, and plenty of other eye candy. I hope you have a powerful graphics card. Keyboard commands allow you to launch various types of rockets, pause the movement of the fireworks, and control the camera with the mouse. OpenGL is used for the graphics and OpenAL is used for the sound." Solar Winds - "This is a very mesmerizing particle effects saver. Tweak the settings a little and you´ll find that you can achieve an amazing number of different patterns. You can also connect the particles with lines for a very different effect." Lattice - "Fly through an endless world of linked rings. You can choose from several different textures for the rings and alter the complexity of the lattice structure." Flux - "This screensaver rocks. If you know anything about strange attractors, you might recognize the patterns created by this saver." Plasma - "Probably the second most psychedelic screensaver in existence. Just try to picture all those colors moving around." Field Lines - "This is a simulation of the electric field lines between charged particles. Physics never looked so good." Flocks - "Here´s a 3D variation on a favorite old theme. Try it out with Chromatek´s ChromaDepth glasses for a cool 3D effect." Cyclone - "This screensaver makes tornadoes on your screen. I wrote it for my storm chasing buddy, but you can have it too. Check out his weather page if you´re interested in meteorology and severe weather."